> Ladies over a size 14 – pick up your needles and choose that new Clasic Elite Yarn and run, don’t walk to your favorite knitting chair, couch, loveseat, floor, whatever and sink your knitting teeth into these 4 new patterns designed with us in mind. They aren’t your Grandmas styles either – they are young, modern and dare I say hip! 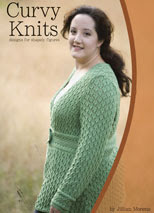 I especially LOVE the cover cardigan pattern knit in Clasic Elites “Premere” yarn. “Premere” is made of 50% pima cotton and 50% tencel – feel it, love it, Knit it!! !